With a very attractive ‘Galactic Space” theme, Genesis Casino manages to really catch the eye. This is a very modern casino with a very sophisticated and professional look and design. Despite being just one year old, the casino has managed to gain a loyal fan following due to its user-friendly interface, excellent selection of games, and quick payouts. South African players will be pleasantly surprised to find an international casino that has a dedicated portal for South Africa, with local customer care and full support for SA Rand. You will not have to make any irritating currency conversions to play at Genesis Casino. In fact, they actually provide you with R15,000 as part of their welcome bonus package. Read on to learn more about all the bonuses you can claim and the games you can play at Genesis Casino. You can access the Genesis Casino from anywhere, be it your home, office, or even when you are commuting on the train or bus! That’s right, this is an online casino that works equally well both on a computer (both PCs and Macs) as well as all mobile devices, regardless of their software system. Genesis can do all this because of its simple design: it is an entirely browser-based casino. Opening it is like opening any of your favourite websites on the internet. And the best part is the optimization, which allows the website to run smoothly on small screens of iPhones as well as Android mobiles. The controls and menu buttons are easy to use even on the smallest of screens. NetEnt is the primary software platform for the games running on this Casino. But it is far from the only one. You see, Genesis is no small casino where you find just a handful of slots and table games from a solitary publisher. Instead, this is a casino brimming with games, over 1300 in fact! Publishers like NetEnt, Evolution Gaming, Quickspin, Play’N Go, and Red Tiger all have their popular titles available at Genesis Casino. Video slots form the bulk of the catalogue, with hundreds of titles on offer. Featuring the latest graphics and multimedia technology, games like Rise of Olympus, Moon Princess, Golden Grimoire and Eastern Emeralds can keep you happy and entertained for hours on end. If the table and live casino games are what you prefer, Genesis Casino has tons of those too, with all classic and modern variations of baccarat, blackjack, roulette, and poker on offer, with live rooms powered by NetEnt and Evolution Gaming providing a superior online gaming experience. Having established publishers and software providers is mandatory in the world of online casinos. Only these companies can provide you with a safe and secure gaming experience. And Genesis is perfectly capable of providing just that to its South African customers. South African players will be pleasantly surprised the first time they visit and register at Genesis Casino. 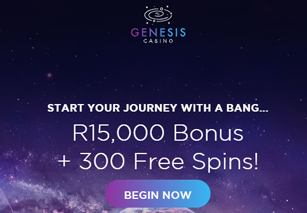 Despite being an international casino, Genesis has a special portal dedicated to South Africans, with all bonuses and promotions available in Rands. The Welcome Bonus includes a 100% cash bonus on your first deposit which can go as high as R1500. And the bonus doesn't stop there. For each of your three subsequent deposits, the casino will provide one 50% and two 25% matching bonuses, all of which can be as high as R4500. It all depends on how much you can deposit: the more you put in, the higher the casino gives you in the form of free cash to bet on their games. All bonuses available at Genesis Casino has a wagering requirement of 40x on the bonus figure before you can cash out the winnings. The parade of promotions and bonuses does not end with the welcome offer. The casino offers regular weekly and weekend offers, with special matching bonuses every time you deposit cash into your account. The fact that Genesis Casino accepts SA Rand payments and withdrawals is a huge advantage for players from the country. The entire process is highly streamlined, with the option of instant deposit through electronic bank transfers, digital wallets, major credit/debit cards, and other modern online transaction services. They have partnered with reliable companies like VISA, Mastercard, Skrill, Neteller, and EasyEFT for all financial transactions. This means that you do not have to worry about the safety and security of your financial data: everything is secured using the latest SSL encryption and other security features. While deposits are instantly processed, the withdrawals will take time, depending on the method you select. If you opt for a direct bank transfer to SA banks, it can take a few days. Ewallets and online transfer will be much faster. The casino has put withdrawal limits as a safety feature to protect your money, with a weekly cap of R82500 and monthly limit of R330,000. You can get higher limits by enrolling in their VIP program. WHAT DO WE THINK OF GENESIS AS A WHOLE? As far as first impressions go, Genesis Casino exudes sophistication, modernity, class. And that is exactly the kind of service and gaming experience you get from the casino once you start spending time on it. This casino is all about style as well as substance. It is one of the best online casinos for all players, including South Africans out there, period. Along with a wide choice of games, you also get world-class security, competent customer care, and quick withdrawals. Add some tasty bonuses, and the Genesis Casino is as close to a complete package as you can get in the world of online gaming.